The next in a line of storms is developing. 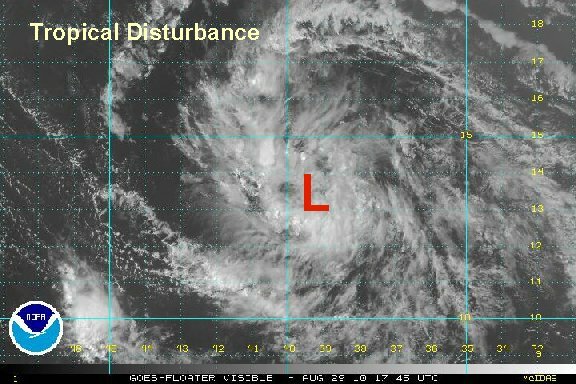 A tropical depression will likely be classified by NHC within the next 24 hours. This soon to be tropical depression 8 has a broad circulation. Convection is still a little limited. 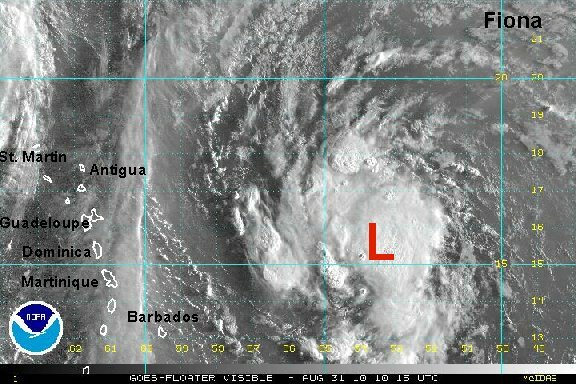 Once convection builds a little more, NHC will classify. 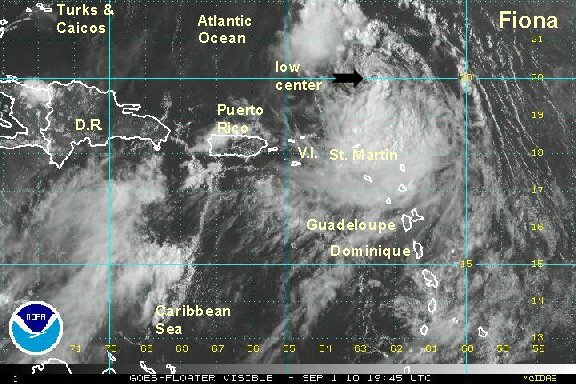 As of 3 pm edt / ast the tropical disturbance was centered near 13.5 N / 39.0 W or about 1575 miles from the Leewards. Top sustained winds are estimated at 30 mph . Movement is west 15 mph Pressure estimated at 978 mb. Forecast models develop this next system and like Earl take it toward the Leewards. This one however is predicted to stay a little farther south toward Puerto Rico and the Turks and Caicos. Predictions are for the low to be near the Leewards by wednesday morning. Remember, this is a very early forecast. The tropical disturbance in the Atlantic still has a very broad circulation with a little more convection today. The hurricane center will probably classify this as the next tropical depression today. It is only a few days behind Earl an will be near the Leewards by Wednesday. As of 10 am edt / ast the tropical disturbance was centered near 13.8 N / 45.0 W or about 1150 miles east southeast of the Leewards. Top sustained winds are estimated at 30 mph . Movement is west at 15 mph Pressure estimated at 978 mb. Forecast models have a wide range of solutions now. Several have it on a similar course like Earl... Leewards then recurve east of the Bahamas. 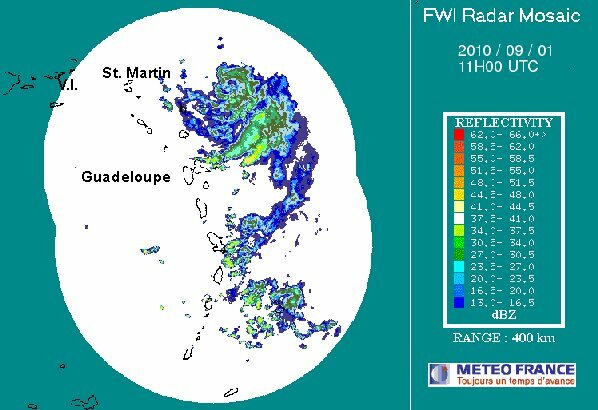 A few have it moving across the northern Antilles. And...some don't even strengthen it very much. Since it is still very weak forecast models are having a hard time figuring out what it will do. Interests in the Lesser Antilles, northern Antilles, Turks and Caicos, and Bahamas should monitor this system. As a surprize to us, the hurricane center skipped the tropical depresion stage and went straight to tropical storm strength. This was based on a wind from a research plane that found a minimal tropical storm wind aboiut 120 nm from the center. We don't believe that it's a storm yet. 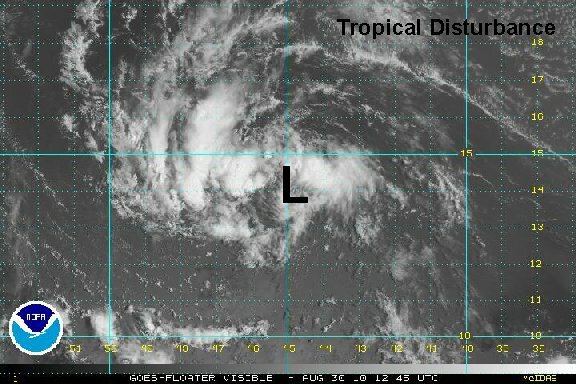 The structure is still lacking organization for a tropical storm. The pressure is also high for a tropical storm classification. As of 6 pm edt / ast tropical storm Fiona was centered near 14.4 N / 48.8 W or about 875 miles east southeast of the Leewards. Top sustained winds are estimated at 35 mph (NHC 40 mph) . Movement is west at 24 mph Pressure estimated at 1007 mb. In general forecast models have a track inbetween Danielle's and Earl's. They take the system to near the Leewards Wednesday and recurve it about halfway between the U.S. coast and Bermuda. The models do not intensify Fiona that much. In fact, they do not have it reaching hurricane strength. That is an early forecast though and can't be totally trusted. Interests in the Lesser Antilles, Turks and Caicos, and Bahamas should monitor this system. We are now on the same page with the hurricane center on Fiona. Fiona is a minimal tropical storm as significant convection has built near the center overnight. 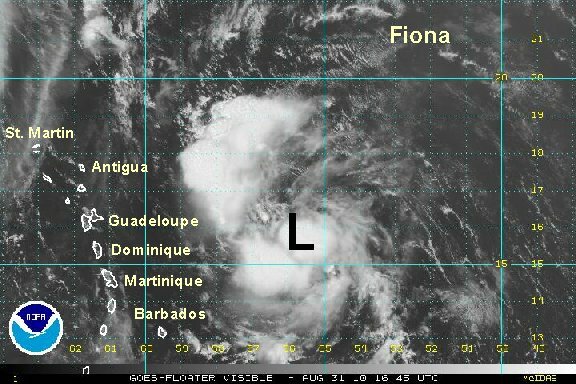 Fiona is quick moving and will be near the Leewards tomorrow. As of 7 am edt / ast tropical storm Fiona was centered near 15.8 N / 53.5 W or about 550 miles east southeast of the Leewards. Top sustained winds are estimated at 40 mph (NHC 40 mph) . 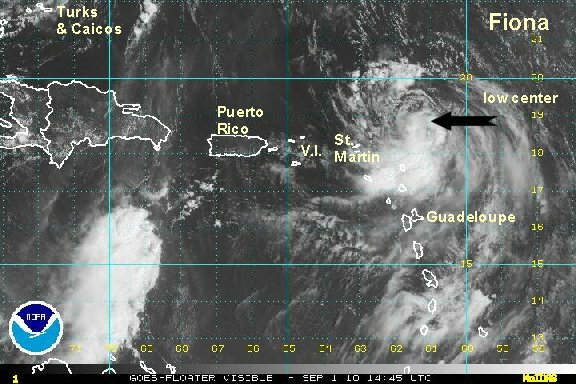 Movement is west northwest at 23 mph Pressure estimated at 1006 mb. In general forecast models have a track inbetween Danielle's and Earl's. They take the system to near the Leewards Wednesday morning and recurve it about halfway between the U.S. coast and Bermuda. The models do not intensify Fiona that much. In fact, they do not have it reaching hurricane strength. Interests in the Lesser Antilles, Turks and Caicos, Bahamas, and Bermuda should monitor this system. Convection associated with Fiona is just picking up a bit. It is near and well ahead of the circuatlion center. The first "weather" to move into the Leewards will be by later this evening / tonight. 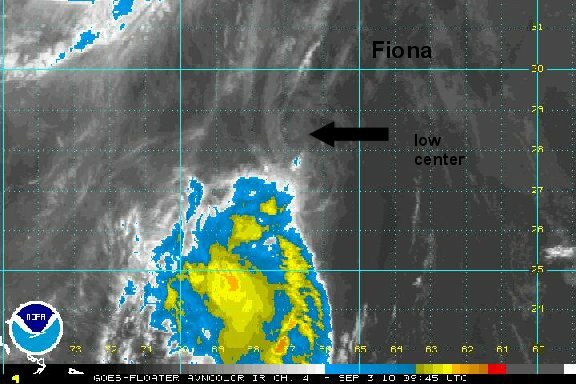 Fiona is reminiscent of Earl starting to strengthen just before the islands. This time however, it is not expected to strengthen into a hurricane as it passes though Wednesday. As of 1 pm edt / ast tropical storm Fiona was centered near 15.8 N / 55.7 W or about 410 miles southeast of the northern Leewards / 375 miles east of Guadeloupe . Top sustained winds are estimated at 45 mph (NHC 40 mph 11 am advisory) . Movement is west northwest at 24 mph Pressure estimated at 1006 mb. 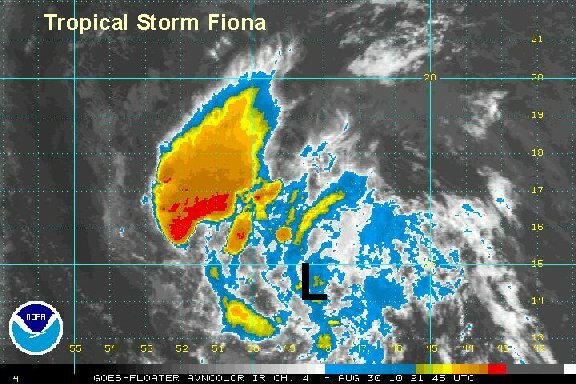 Reports from the recon and satellite imagery show that Fiona is holding on as a minimal tropical storm. Even though the track is similar to Earl's, the results will be different. Locally heay rain is still possible, but winds will be near minimal tropical storm force only for the Leewards. As of 8 pm edt / ast tropical storm Fiona was centered near 16.8 N / 58.7 W or about 270 miles east of the northern Leewards. Top sustained winds are estimated at 40 mph (NHC 40 mph 8 pm advisory) . Movement is west northwest at 24 mph Pressure estimated at 1006 mb. Fiona will be heading near the Leewards Wednesday morning and recurve well east of the Bahamas to about halfway between the U.S. coast and Bermuda. The models do not intensify Fiona that much. In fact, they do not have it reaching hurricane strength. It looks like Fiona has strengthened a little overnight. It is more organized on satellite and radar. In fact the center is now failry well seen on the radar presentation. The recon also reported winds a little higher than previously. Fiona will bring tropical storm winds to the northeastern Leewards as it passes by this morning into this afternoon. Rainfall totals of 1-4" can be expected. As of 7 am edt / ast tropical storm Fiona was centered near 17.6 N / 60.7 W or about 70 miles east of Antigua / 150 east southeast of St. Martin. Top sustained winds are estimated at 50 mph (NHC 45 mph 5 am advisory) . Movement is west northwest at 14 mph Pressure estimated at 1004 mb. 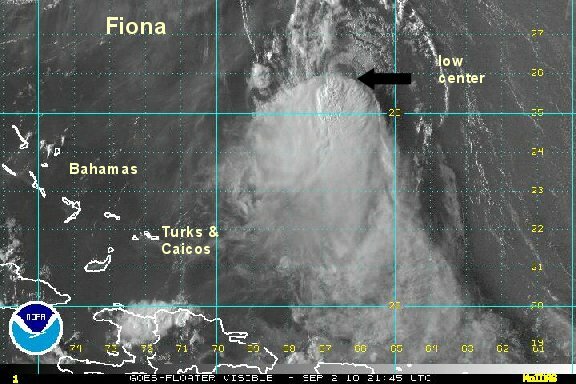 Fiona is just east of Antigua this morning. It will recurve well east of the Bahamas then move northward between Bermuda and the U.S. coast. Recent models have shifted the track a little closer to Bermuda. Forecast models still do not strengthen Fiona into a hurricane. 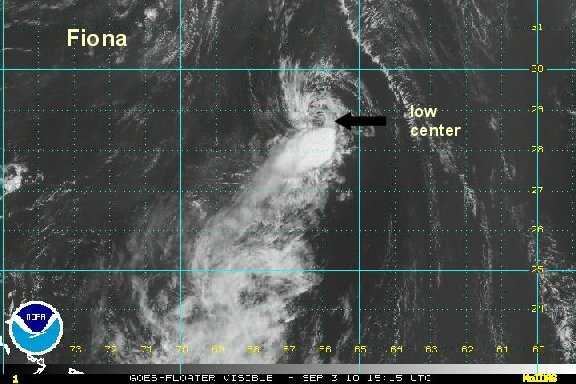 Tropical storm Fiona is getting more disorganized by wind shear. We are going to go against nhc for the wind speed with the recent satellite appearance. A recon did find some higher flight level winds, but it is doubtful if any of the Leewards will see any winds above minimal tropical storm force - if at all. As of 11 am edt / ast tropical storm Fiona was centered near 18.8 N / 61.7 W or about 85 miles north or Barbuda. Top sustained winds are estimated at 40 mph (NHC 60 mph 11 am advisory) . Movement is northwest at 14 mph Pressure estimated at 998 mb. 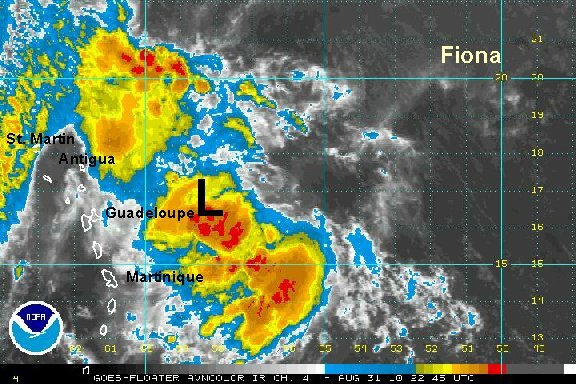 Fiona is moving north of the northeastern Leewards at midday. It will recurve well east of the Bahamas then move northward between Bermuda and the U.S. coast. Recent models have shifted the track a little closer to Bermuda. Forecast models still do not strengthen Fiona into a hurricane. Most weaken it in southwesterly wind shear. Interests in the northeastern Leewards and Bermuda should monitor this system. Fiona is fighting for its life. Wind shear has ripped the convection from the circulation center. We'll be generous and say that it is still a minimal tropical storm at 40 mph. In reality 35 mph is probably the strongest sustained winds in convection north of the Leewards. The Leewards are reporting winds of 10-20 mph. That's it. The basis for NHC holding onto a 60 mph tropical storm at 2 pm was from a recon report of 70 knots. That had to be a localized convective downburst and not representative of the sustained surface winds with the tropical cyclone. It appears that Fiona is turning a little and almost moving north northwest. ** 5pm advisory ** NHC held onto 60 mph and waiting for another recon fix. We are shocked to see the winds held at a sustained 60 mph. As of 4 pm edt / ast tropical storm Fiona was centered near 20.1° N / 62.5° W or about 115 miles north of the northern Leewards. Top sustained winds are estimated at 40 mph (NHC 60 mph 5 pm advisory) . Movement is northwest at 20 mph Pressure estimated at 997 mb. 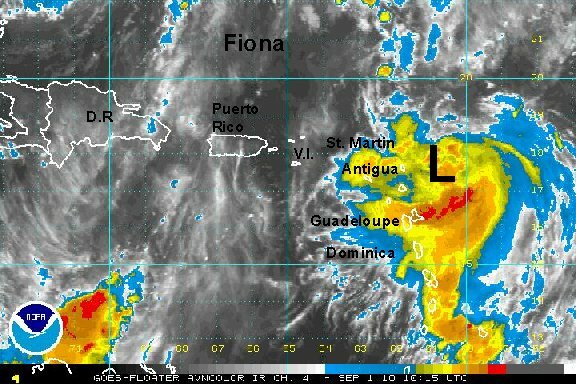 Fiona is moving north of the northern Leewards this evening. It will recurve well east of the Bahamas then move northward between Bermuda and the U.S. coast. Models have the track a little closer to Bermuda. Forecast models still do not strengthen Fiona into a hurricane. Most weaken it in southwesterly wind shear. Interests in Bermuda should monitor this system. 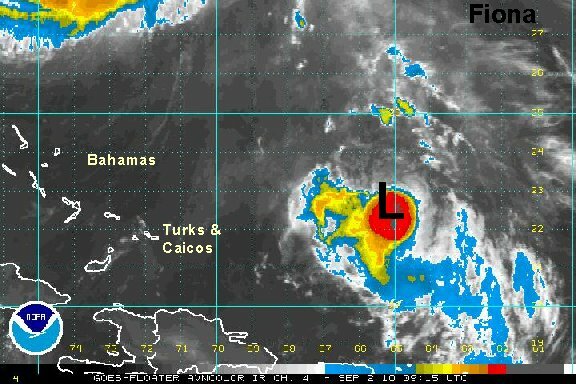 Interesting to note that Fiona gained a burst of convection last night closer to the low center. With the convection building near the low we have increased winds slightly to 45 mph. We are now close to the hurricane center's estimate of 50 mph - which was lowered overnight. As of 6 am edt / ast tropical storm Fiona was centered near 22.7° N / 65.5° W or about 660 miles south of Bermuda. Top sustained winds are estimated at 45 mph (NHC 50 mph 5 am advisory) . Movement is northwest at 17 mph Pressure estimated at 1000 mb. Foercasts have shifted a little east toward Bermuda. 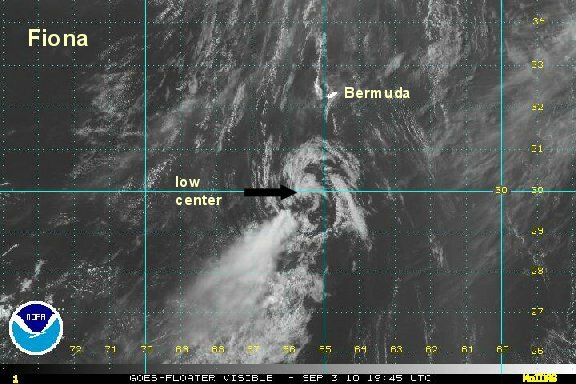 This would place Fiona about 50-75 miles west of Bermuda overnight Friday. Fiona is still not expected to become a hurricane as it moves northward. Interests in Bermuda should closely follow this system. 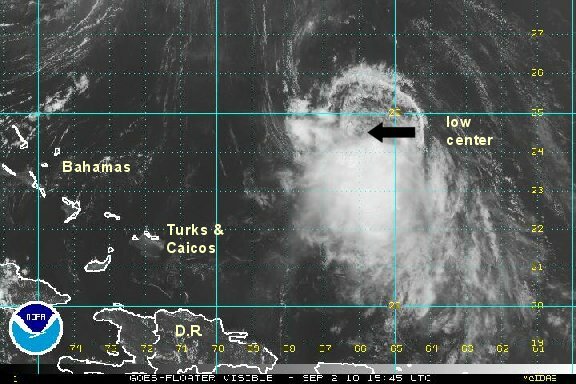 Fiona is still fighting wind shear with the low level center badly exposed. Deep convection is hanging on to the south side of the circulation simular to yesterday. As of 1 pm edt / ast tropical storm Fiona was centered near 24.8° N / 66.2° W or about 530 miles south southwest of Bermuda. Top sustained winds are estimated at 45 mph (NHC 50 mph 11 am advisory) . Movement is north northwest at 17 mph Pressure estimated at 1002 mb. Foercasts have again shifted a little east to near Bermuda. This would place Fiona about near Bermuda overnight Friday. Fiona is still not expected to become a hurricane as it moves northward. Deep convection is just starting to build over the center of circulation again. This must indicate wind shear relaxing. We'll be watching closely to see if the convections builds north again. Because of the convection building again, we are now in agreement with the hurricane center at 50 mph winds. As of 7 pm edt / ast tropical storm Fiona was centered near 25.8° N / 66.7° W or about 475 miles south southwest of Bermuda. Top sustained winds are estimated at 50 mph (NHC 50 mph 5 pm advisory) . Movement is north northwest at 17 mph Pressure estimated at 1002 mb. Forecasts take Fiona near Bermuda overnight Friday. Fiona is still not expected to become a hurricane as it moves northward. Once again we are departing from NHC's official estimate. Wind shear is destroying Fiona. This has especially been noticable over the last 3-4 hours. The deep convection is well south and none exists with the circulation center. We don't believe that Fiona even qualifies as a tropical storm any longer. We don't think that NHC will drop winds that low on the 8 am advisory. Our guess is maybe 40 mph. As of 7 am edt / ast tropical storm Fiona was centered near 28.5° N / 66.7° W or about 290 miles south southwest of Bermuda. Top sustained winds are estimated at 35 mph (NHC 50 mph 5 am advisory) . Movement is north at 13 mph Pressure estimated at 1005 mb. Forecasts take Fiona near Bermuda tonight. We still believe that Fiona is no longer a tropical storm. Reports from the recon showed a surface wind of about 30 mph. Higher winds at flight level were a little stronger in a small cluster of thunderstorms on the south side of the circulation. The low center is also not as well defined. As of 12 pm edt / ast tropical storm Fiona was centered near 29.0° N / 66.2° W or about 240 miles south southwest of Bermuda. Top sustained winds are estimated at 35 mph (NHC 45 mph 11 am advisory) . Movement is north northeast at 13 mph Pressure estimated at 1010 mb. Forecasts take Fiona near Bermuda late tonight. This will be our last update on Fiona. It is a weak swirl of low pressure with the last gasp of a thunderstorm well southwest of the circulation center. NHC finally dropped the winds to 40 mph. We're estimating 35 mph and that may be high. 1011 mb is very high for something classified as a tropical storm.... If you are visiting or live on Bermuda you may notice a slight wind shift or shower overnight. That will be Fiona passing. Fiona - over and out. As of 5 pm edt / ast tropical storm Fiona was centered near 30.0° N / 65.5° W or about 165 miles south southwest of Bermuda. Top sustained winds are estimated at 35 mph (NHC 40 mph 5 pm advisory) . Movement is north northeast at 13 mph Pressure estimated at 1011 mb.